The 7.62×51mm M40, United States Marine Corps standard-issue sniper rifle. The Accuracy International Arctic Warfare series of sniper rifles is standard issue in the armies of many countries, including those of Britain, Ireland and Germany (picture shows a rifle of the German Army). The Whitworth rifle was arguably the first long-range sniper rifle in the world. Designed by Sir Joseph Whitworth, a prominent British engineer, it used twisted hexagonal barrels instead of traditional round rifled barrels, which meant that the projectile did not have to bite into grooves as was done with conventional rifling. His rifle was far more accurate than the Pattern 1853 Enfield, which had shown some weaknesses during the recent Crimean War. At trials in 1857, which tested the accuracy and range of both weapons, Whitworth's design outperformed the Enfield at a rate of about three to one. Also, the Whitworth rifle was able to hit the target at a range of 2,000 yards, whereas the Enfield could only manage it at a distance of 1,400 yards. During the Boer War, the latest breech-loading rifled guns with magazine and smokeless powder were used by both sides. The British were equipped with the Lee–Metford rifle, while the Boers had received the latest Mauser rifles from Germany. In the open terrain of South Africa, the marksman was a crucial component in battle. The Lovat Scouts was a British Army unit formed in 1899 that was renowned for the expert marksmanship and stalking skills of its personnel. The men wore ghillie suits for camouflage and were expertly skilled in observation. Hesketh Hesketh-Prichard said of them that "keener men never lived". After the Boer War, the Scouts became the first official sniper unit in the British Army. The choice between bolt-action and semi-automatic (more commonly known as recoil or gas operation) is usually determined by specific requirements of the sniper's role in a particular organization, with each design having advantages and disadvantages. For a given cartridge, a bolt-action rifle is cheaper to build and maintain, more reliable, and lighter, due to fewer moving parts in the mechanism. In addition, the absence of uncontrolled automatic cartridge case ejection helps avoid revealing the firer's position. Semi-automatic weapons can serve both as battle rifle and sniper rifle, and allow for a greater rate (and hence volume) of fire. As such rifles may be modified service rifles, an additional benefit can be commonality of operation with the issued infantry rifle. A bolt action is most commonly used in both military and police roles due to its higher accuracy and ease of maintenance. Anti-materiel applications such as mine clearing and special forces operations tend to use semi-automatics. Worldwide, the trend is similar. The preferred sniper cartridge in Russia is another .30 caliber military cartridge, the 7.62×54 mm R, which has similar performance to the 7.62×51mm. This cartridge was introduced in 1891, and both Russian sniper rifles of the modern era, the Mosin–Nagant and the Dragunov sniper rifle, are chambered for it. M82A1 SASR (Special Applications Scoped Rifle or Semi-Automatic Sniper Rifle), a .50 caliber sniper rifle used as an anti-materiel rifle. Anti-materiel rifles tend to be semi-automatic and of a larger caliber than anti-personnel rifles, using cartridges such as the .50 BMG, 12.7×108mm Russian or even 14.5×114mm Russian and 20mm. These large cartridges are required to be able to fire projectiles containing payloads such as explosives, armor-piercing cores, incendiaries or combinations of these, such as the Raufoss Mk211 projectile. Due to the considerable size and weight of anti-materiel rifles, 2- or 3-man sniper teams become necessary. H-S Precision Pro Series 2000 HTR sniper rifle with adjustable stock and accessories rails. A military-issue battle rifle or assault rifle is usually capable of between 3-6 minute of angle (MOA) (1-2 mrad) accuracy. A standard-issue military sniper rifle is typically capable of 1-3 MOA (0.3-1 mrad) accuracy, with a police sniper rifle capable of 0.25-1.5 MOA (0.1-0.5 mrad) accuracy. For comparison, a competition target or benchrest rifle may be capable of accuracy up to 0.15-0.3 MOA (0.05-0.1 mrad). A 2008 United States military market survey for a Precision Sniper Rifle (PSR) calls for 1 MOA (0.3 mrad) extreme vertical spread for all shots in a 5-round group fired at targets at 300, 600, 900, 1,200 and 1,500 meters. In 2009 a United States Special Operations Command market survey calls for 1 MOA (0.28 mrad) extreme vertical spread for all shots in a 10-round group fired at targets at 300, 600, 900, 1,200 and 1,500 meters. The 2009 Precession Sniper Rifle requirements state that the PSR when fired without suppressor shall provide a confidence factor of 80% that the weapon and ammunition combination is capable of holding 1 MOA (0.28 mrad) extreme vertical spread. This shall be calculated from 150 ten (10) round groups that were fired unsuppressed. No individual group shall exceed 1.5 MOA (0.42 mrad) extreme vertical spread. All accuracy will be taken at the 1,500 meter point. In 2008 the US military adopted the M110 Semi-Automatic Sniper System which has corresponding maximum allowed extreme spread of 1.8 MOA (0.5 mrad) for a 5-shot group on 300 feet, using M118LR ammunition or equivalent. 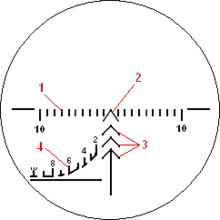 In 2010 the maximum bullet dispersion requirement for the M24 .300 Winchester Magnum corresponds to 1.4 MOA (0.39 mrad) extreme spread for 5 shot group on 100 meters. In 2011, the US military adapted the .300 Winchester Magnum M2010 Enhanced Sniper Rifle that has to meet an accuracy requirement to fire ≤ 1 MOA/0.28 mrad (less than a 2-inch shot group at 200 yards) before being released for fielding. The recent trend in specialized military sniper rifles is towards larger calibers that offer relatively favorable hit probabilities at greater range, such as the anti-personnel .338 Lapua Magnum cartridge and anti-materiel cartridges like the .50 BMG and the 14.5×114mm. This allows snipers to take fewer risks, and spend less time finding concealment when facing enemies that are not equipped with similar weapons. Maximum range claims made by military organizations and materiel manufacturers regarding sniper weapon systems are not based on consistent or strictly scientific criteria. The problem is only the bullet interacts after a relatively long flight path with the target (can also be a materiel target for a sniper bullet). This implies that variables such as the minimal required hit probability, local atmospheric conditions, properties and velocity of the employed bullet (parts), properties of the target and the desired terminal effect are major relevant factors that determine the maximum effective range of the employed system. ↑ Pegler, Martin (2011). Out of Nowhere: A history of the military sniper, from the Sharpshooter to Afghanistan. Osprey Publishing. Retrieved 2013-11-18. ↑ Raudzens, George. "War-Winning Weapons: The Measurement of Technological Determinism in Military History". The Journal of Military History. vol. 54, no. 4, 1990, p. 415. ↑ "Lovat Scouts, Sharpshooters - United Kingdom". ↑ Pegler, Martin. Sniper Rifles: From the 19th to the 21st Century. Oxford: Osprey Publishing, 2010, p. 31. ↑ Pegler, Martin. Out Of Nowhere: A History Of The Military Sniper. Oxford: Osprey Publishing, 2004, p. 222. 1 2 3 "Telescopic Sights For Rifles." The British Medical Journal. vol. 1, no. 2891, 1916, p. 765. ↑ Pegler, Martin. Out Of Nowhere: A History Of The Military Sniper. Oxford: Osprey Publishing, 2004, p. 16. ↑ Pegler, Martin. Out Of Nowhere: A History Of The Military Sniper. Oxford: Osprey Publishing, 2004, p. 19. ↑ Pegler, Martin. Out Of Nowhere: A History Of The Military Sniper. Oxford: Osprey Publishing, 2004, p. 19-20. ↑ Raudzens, George. "War-Winning Weapons: The Measurement of Technological Determinism in Military History". The Journal of Military History. vol. 54, no. 4, 1990, p. 420. 1 2 Pegler, Martin. Sniper Rifles: From the 19th to the 21st Century. Oxford: Osprey Publishing, 2010, p. 6. ↑ Lebleu, Jon. Long Rifle: One Man's Deadly Sniper Missions in Iraq and Afghanistan. Guilford: The Lyons Press, 2008, p. 11. ↑ Pegler, Martin. Sniper Rifles: From the 19th to the 21st Century. Oxford: Osprey Publishing, 2010, p. 75. 1 2 Popenker, Max. "Modern sniper rifles". World Guns, 2001. ↑ The Ultimate Sniper: an Advanced Training Manual for Military and Police Snipers, Maj. John L. Plaster, 1993. The information about counter-sniper operations describes techniques for identifying snipers amongst groups of other soldiers. The most easily recognizable feature of a sniper from a great distance is the fact that the sniper's rifle is longer than all the others. ↑ T.W. Lee. Military Technologies of the World. p. 237. ↑ "AMSAA Technical report No. 461" (PDF). Retrieved 2013-08-17. ↑ "MIL-R-71126(AR) at everyspec.com". Retrieved 26 October 2014. ↑ "Precession Sniper Rifle - Solicitation Number: H92222-09-PSR". Fbo.gov. Retrieved 2013-08-17. ↑ "Precision Sniper Rifle (PSR) - Solicitation Number: H92222-09-PSR2". Fbo.gov. Retrieved 2013-08-17. ↑ Tom Beckstrand (2009-07-01). "SOCOM PSR Contenders". Tactical-life.com. Retrieved 2013-08-17. ↑ "Precision Sniper Rifles Systems (PSR) Draft Go/No-Go Requirements" (PDF). Retrieved 2013-08-17. ↑ "Precision Sniper Rifle (PSR) Vendor Questionnaire" (PDF). Retrieved 2013-08-17. ↑ "M24 Sniper Weapon System Reconfiguration". Fbo.gov. Retrieved 2013-08-17. ↑ The FBI, a national-level policing organization, has recently specified an accuracy level of 0.5 MOA for 5 shots at 100 yd for sniper rifles issued to their SWAT teams: Johnson, D: Precision Pair, Guns & Ammo, February 2005. ↑ Minimum documented range is 5 yards, maximum documented range is 187 yards: Police Sniper Utilization Survey, American Sniper Association, 2006, full report available to military and law enforcement agencies only. Some information publicly available from The Ultimate Sniper: an Advanced Training Manual for Military and Police Snipers, Major John Plaster, 1993. ↑ Police Sniper Training, Major John Plaster, 1990. ↑ "Philippine MSSR - Marine Scout Sniper Rifle - Sniper Central.com". Retrieved 2009-05-22.